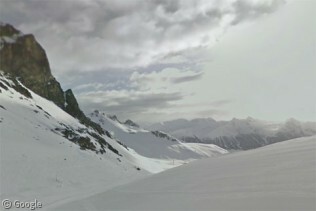 Over the past few years Google has captured imagery of ski resorts and other snowy locations using Street View snowmobiles in a number of countries. With the northern hemisphere in the midst of winter, it’s a good time to take a look at a few of these, beginning with this spectacular view from Sölden in Austria. 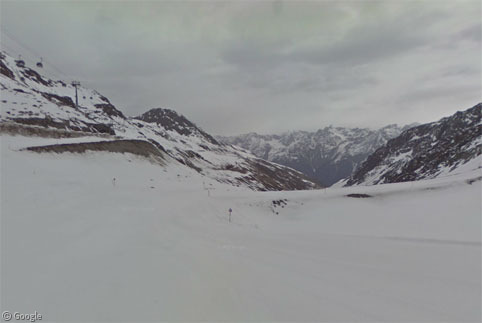 The Austrian government ended a ban on Street View three years ago, but Google has yet to release any road-based imagery, so this ski resort may be the only place in the country currently visible on Google Maps from ground level. 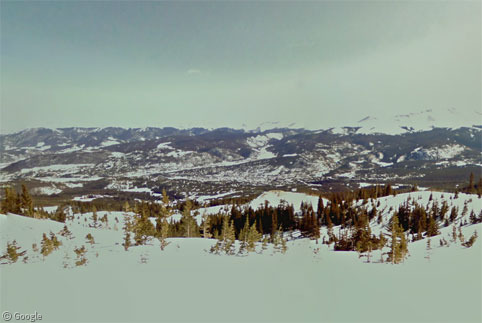 The resort has almost 150km (90miles) of trails and 36 lifts, and is visited by hundreds of thousands of skiers each winter. 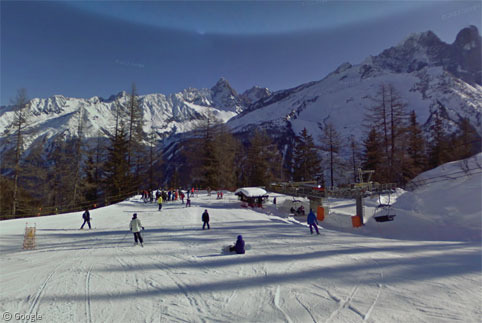 It is usually host to the first ski races of the season – in October – on the Rettenbach Glacier. 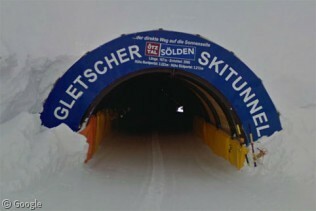 One of the more interesting features of this resort is the 170m (558′) tunnel which connects two different areas – this YouTube video shows what it is like to ski through it! 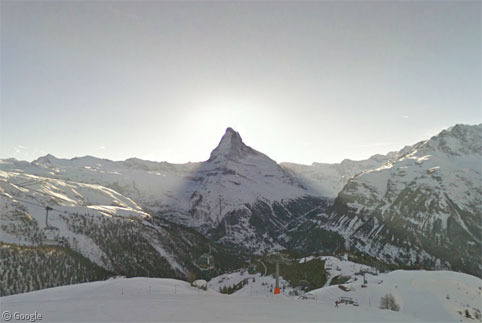 Several other Swiss resorts are also available on Street View, including Zermatt, which gives us this stunning view of the Matterhorn’s distinctive shape silhouetted by the sun. 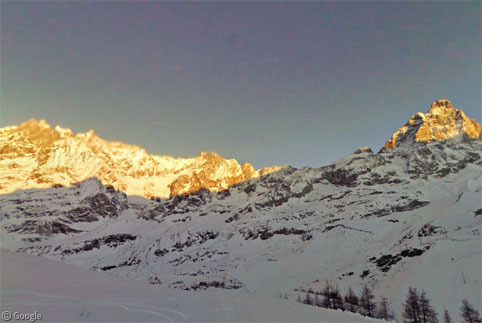 And just to the south in Italy, near Breuil-Cervinia we can find this quite lovely image of the sun rise catching the tops of the nearby peaks. 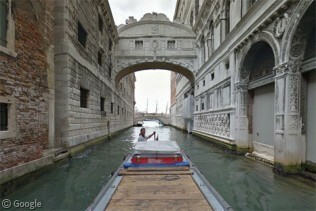 It’s not just downhill ski resorts which appear on Street View. 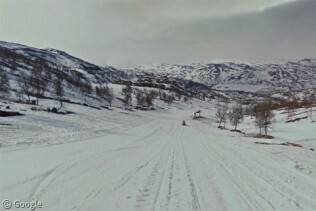 In central Norway there are a number of large wilderness areas with many snowmobile trails captured. 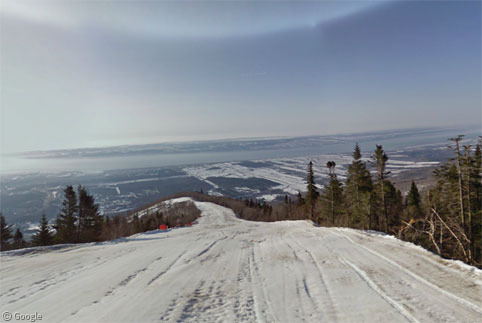 For some reason there is a boat on top of a hill, maybe in case of unexpected snow-melt and flooding, but more likely it is towed behind a snowmobile carrying supplies. 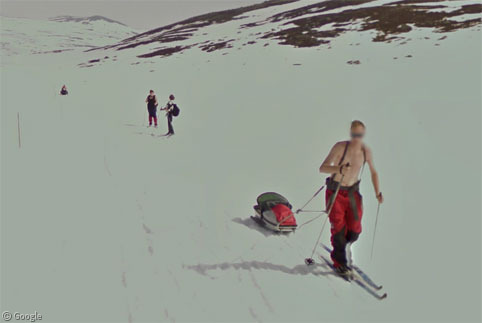 And further north we find what appear to be combined cross-country ski and snowmobile trails, apparently clothing-optional, judging by this half-naked skier! For more snowy goodness from Norway, please read our post about Svalbard. 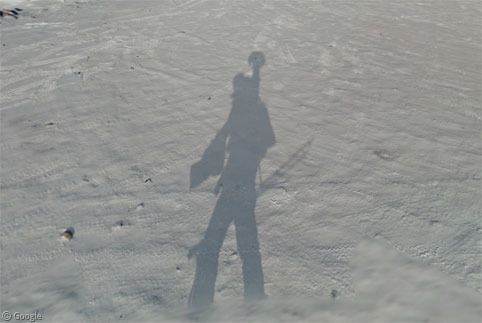 In Iqaluit, the capital of Canada’s Nunavut territory, Google used the human-carried Trekker to capture imagery of the snowy streets, with clear shadows of the person carrying the Trekker visible in the strong sunlight. 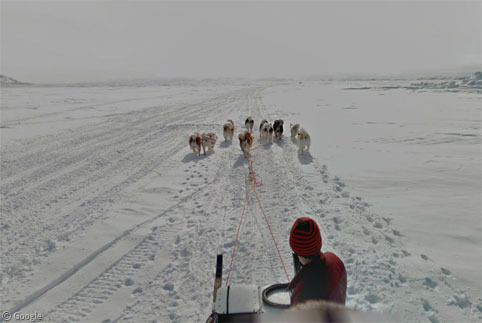 However, when it came to the frozen waters of Frobisher Bay, they put the person with the Trekker (or maybe just the Trekker itself) onto a dog sled to be hauled across the ice – as far as we can tell the only canine-powered imagery currently available on Street View! Winter doesn’t just bring snow sports. 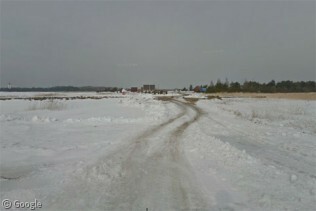 For several locations in the far north, winter means ice roads which provide vehicle access for a few months of the year to communities normally only accessible by plane or boat. This can often mean more affordable fresh produce and food as well as cheaper fuel and other supplies. 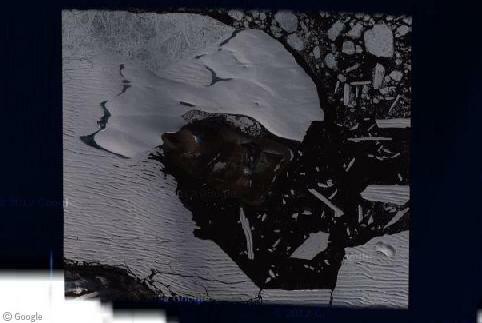 Built across a frozen sea or a series of lakes, ice roads can usually be opened to traffic once the ice reaches 1m (3 feet) thick. 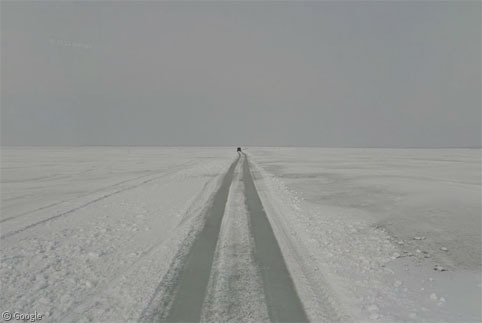 They are unsurprisingly rather dangerous – breaking through the ice in a large truck would be hard to survive – so weight and speed limits are strictly enforced, as well as the number of vehicles on the ice and the distance between them. 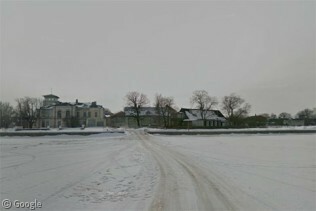 … and the 3km road between Haapsalu and Noarootsi. 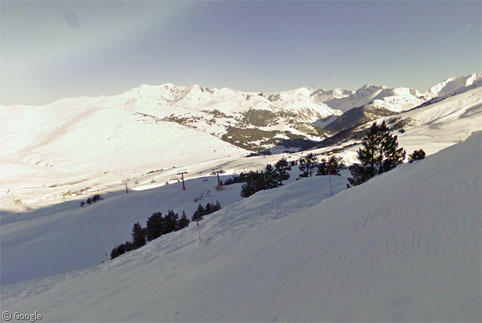 We’ll wrap up with a look at the scenery at a few more ski resorts, with one chosen at random from each country where we could find imagery. 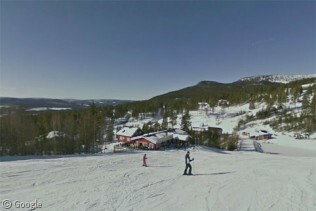 In Sweden, Vemdalen, which has both downhill runs and cross-country trails, with the Street View snowmobile attracting stares everywhere. 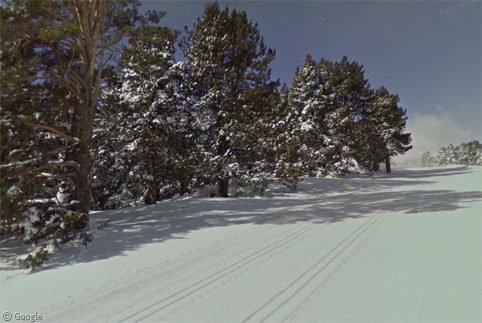 If you know of any other winter sports or particularly snowy locations captured on Street View, please post links in the comments!